LEEVAC Shipyards Jennings LLC, of Jennings, LA, a subsidiary of LEEVAC Shipyards, LLC has signed contracts with Hornbeck Offshore Services, LLC, an affiliate of Hornbeck Offshore Services, Inc. of Covington, LA for the construction of two STX Marine SV 310 Multi-Purpose Supply Vessels; 302’ x 76’ x 26’, 12,070 BHP diesel electric powered MPSV’s. “These will be the twenty-third and twenty-fourth vessels to be built by LEEVAC for Hornbeck” says Christian Vaccari, President and CEO of LEEVAC. The SV 310 is a very complex vessel design with unique characteristics integrated into the design by Hornbeck Offshore to meet a number of subsea inspection, repair and maintenance (IMR) support and heavy lift requirements. The vessels will be outfitted with a 250 ton crane provided by Cargotech, and will be powered by four (4) Caterpillar Model 3516C Tier 3 IMO II Marine variable speed diesel propulsion generator sets rated at 2250 kw each. The propulsion drives and thrusters are being provided by Schottel. GE Power Conversion is the vendor for the integrated electrical system, power management, vessel control, DP-2 systems, machinery alarms, power and propulsion systems. Marine Interior Systems has been selected for the joiner work and Marine Aluminum will be providing the helideck system rated for a Sikorsky S-92 helicopter. The vessel will be built to ABS, USGC and SOLAS classifications. Additionally, will be ABS Classed with the XA1 Offshore Support Vessel (FFV-1) notation for off ship fire-fighting capabilities and SPS (Special Purpose Ship). 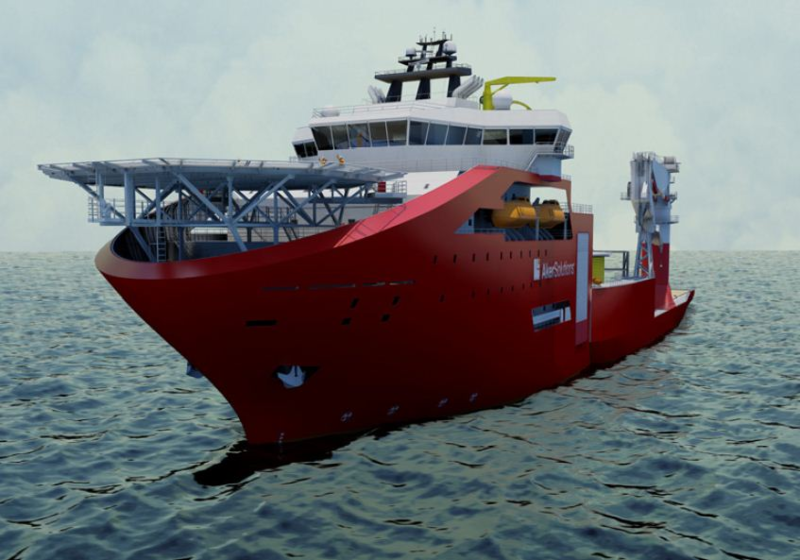 Cargotec’s MacGregor has received EUR 37 million order from Hornbeck Offshore Services Inc. to deliver four 250-tonne active heave-compensated (AHC) subsea cranes for four multi-purpose supply vessels (MPSV). The cranes will be delivered between fourth quarter 2014 and third quarter 2015. The order is booked in the second quarter 2013 order intake. DOF Subsea USA has entered into a long-term charter agreement with Harvey Gulf International Marine for the new build DP II Multipurpose Construction Vessel, the Harvey Deep-Sea. The four year charter agreement will commence upon delivery of the vessel from Easter Shipyard, Florida in June 2013. The vessel is the only new build Jones Act compliant construction vessel available to the market until the latter part of 2015. Since 2010, DOF Subsea North America has experienced strong growth in capability and market recognition, delivering to the DOF Subsea Group important and challenging projects using the existing Atlantic fleet. This charter is an integral part of DOF Subsea’s planned expansion strategy as a global service provider for the deep-water offshore Survey, IMR and Construction market. World Maritime News – DOF Subsea Charters Harvey Gulf’s Newbuild CSV. Oceaneering International, Inc. announced today that it has entered into a five-year charter for use of the Cade Candies, a multi-service subsea support vessel owned by Otto Candies LLC. The charter is expected to commence during the second quarter of 2013. This state-of-the-art, U.S. flagged vessel was built in 2010. It has an overall length of approximately 309 feet (94 meters), a Class 2 dynamic positioning system, accommodations for 69 personnel, a helideck, a 150-ton active heave compensated crane, and a working moonpool. Oceaneering’s current rolling, short-term charter contract on the Cade Candies, in place since November 2011, will continue through early 2013. At that time, the vessel will enter a shipyard to undergo modifications to enhance its project capabilities. While in the shipyard, Oceaneering’s two, high-specification, work class ROVs onboard the vessel will be repositioned and fully integrated into the vessel for more effective operations. The vessel will also be equipped with a satellite communications system capable of transmitting streaming video for real-time work observation by shore personnel. To be renamed the Ocean Alliance, the vessel will be used to augment Oceaneering’s ability to provide subsea intervention services in the ultra-deep waters of the Gulf of Mexico (GOM). These services are required to perform inspection, maintenance, and repair (IMR) projects and hardware installations. IMR projects are expected to include chemical well stimulation and hydrate remediation. Hardware installations are expected to include umbilicals, subsea trees, flowline jumpers, flying leads, and manifolds. Oceaneering Charters Subsea Support Vessel from Otto Candies (USA)| Offshore Energy Today. The AMC Connector, the largest and most advanced cable- and pipe-laying vessel for deep ocean operations has arrived to Stavanger, Norway, to undergo modifications. The vessel will be docked at GMC Yard in Buøy outside Stavanger until March 11th 2012. The 156-meter long multi-purpose vessel, AMC Connector, is an advanced ship with a high cargo capacity, a variety of special equipment and more than 190 kilometres of cable length. GMC Yard will modify the ballast tanks and building sponsoons under the hull. Work to be carried out includes adding a new auxiliary keel, installing a new stabilising tank and a new VLS tower on the vessel. GMC Yard has docking capacity for vessels up to 280 meters, and the AMC Connector has no problem fitting into the large Dock 2 at Buøy. The vessel will be used for laying the power cable from land to the Goliath-field in the Barents Sea.